Lakes, ponds, slow areas of rivers, deep bogs. 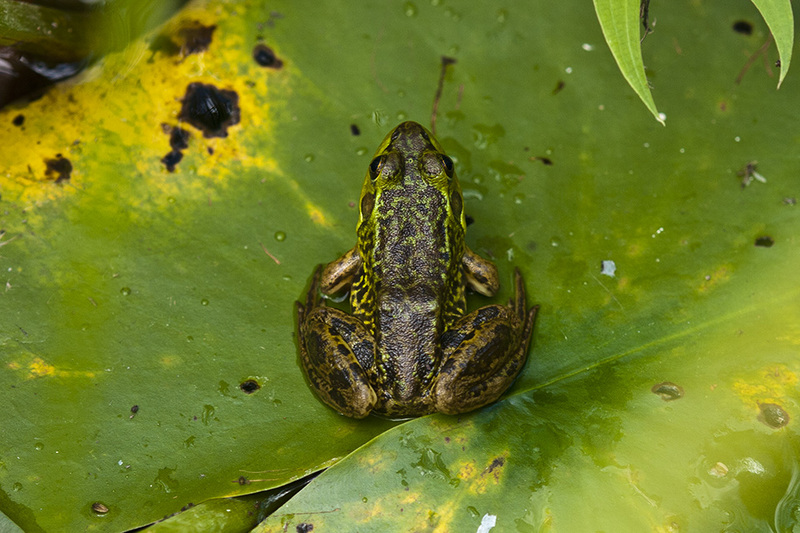 This is a medium size frog, 1¾″ to 3″ long at maturity. The background color is olive-brown to green. The back and sides are covered with dark brown spots or mottling. The chin, throat, and belly are yellowish-white, and may have gray spotting or mottling. The skin is smooth, not warty. When rubbed the skin emits a mink-like odor that has been compared to rotting onions. There are usually no raised ridges (dorsolateral folds) on the back. If present they are poorly developed. The disk covering the ear opening (tympanum) in males is larger than the eye. In females it is the same size or slightly smaller than the eye. The hind feet has a broad web covering all of the toes, with only the tip of the fourth toe free. Green frog (Rana clamitans) has well-defined dorsolateral folds on the back. The hind feet are only partially webbed. The skin does not produce a rotting onion odor when rubbed. Spiders, snails, dragonflies, whirligig and other beetles, earthworms, and other invertebrates. Between late May and August the female lays a mass of 500 to 4,000 eggs under water on the submerged stem of an aquatic plant. The egg mass often detaches and sinks to the bottom. The amount of time the eggs take to hatch is variable. When the egg hatches a tadpole emerges. Some tadpoles metamorphose into froglets after about one year, others require two years. 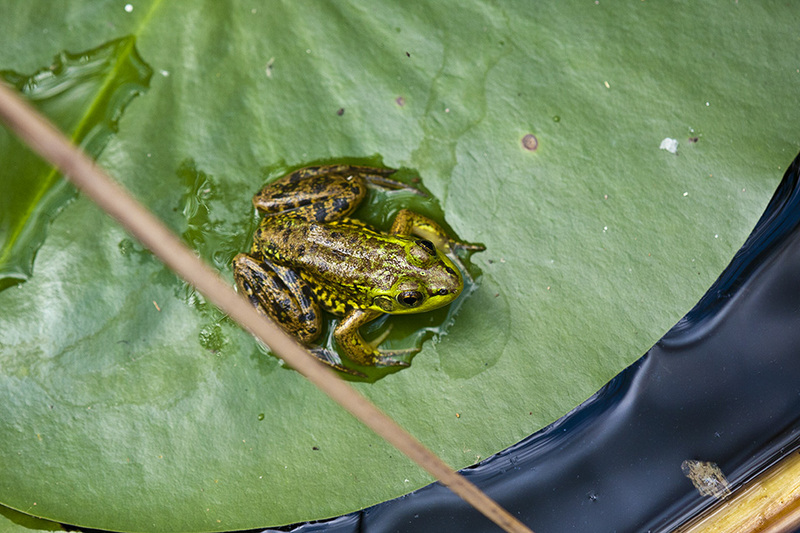 At the time of metamorphosis the froglets are almost 60% of their final adult size. To avoid freezing, overwintering tadpoles and adults hibernate in the mud at the bottom of the same water they inhabited the rest of the year. They enter hibernation in late September and emerge in late April or early May. Most mink frogs live only 1 or 2 years after metamorphosis. Males sometimes survive 3 years, females sometimes 4 years. Adults can often be seen sitting on lily pads. 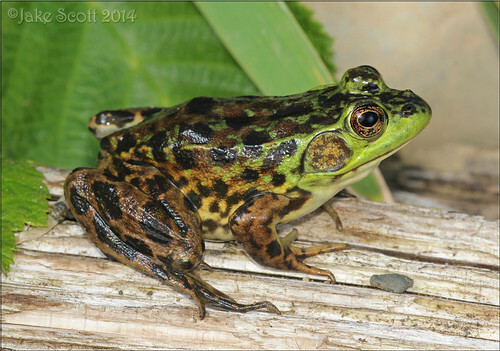 In 2006 most North American true frogs were transferred from the genus Rana to the genus Lithobates by Frost et al. The change was controversial and was not accepted by all authorities. 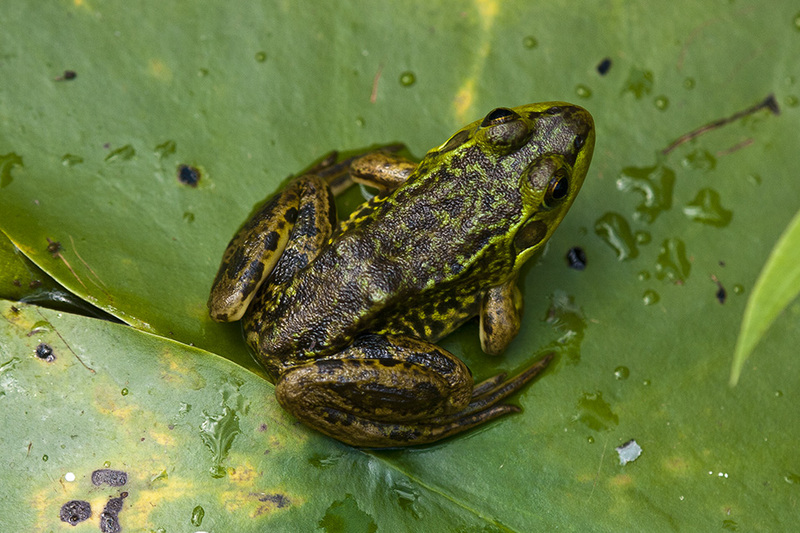 In 2008 and 2009 the change was rejected by Stuart, Pauly et al., and other systematic reviews, and in 2009 North American true frogs were returned to their previous classification. 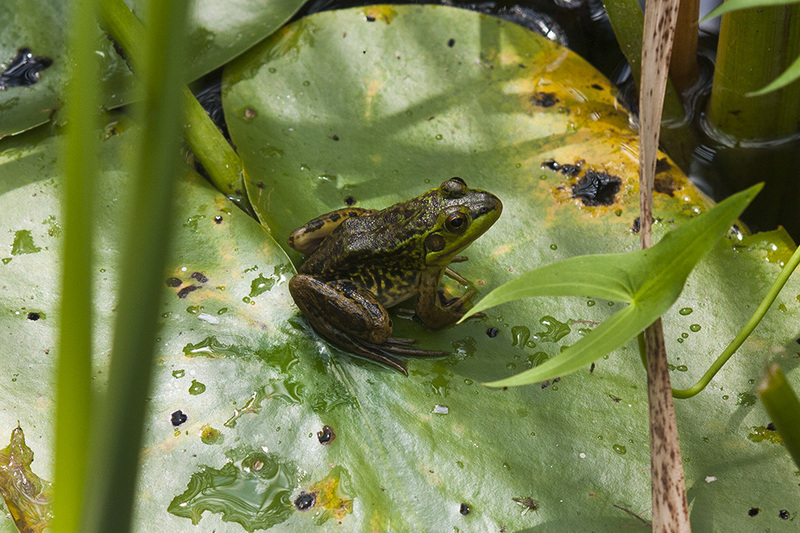 Lithobates is once again a subgenus of Rana. ITIS37 and Amphibian Species of the World61 continue to use the 2006-08 classification. NCBI34 and UniProt33 use the new classification. 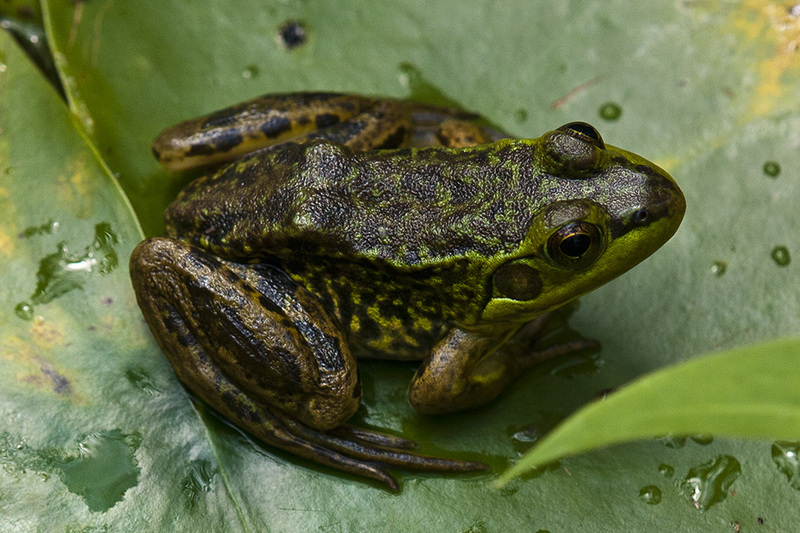 AmphibiaWeb60 suggests using the original name followed by the subgenus name in parentheses, in this case Rana (Lithobates) septentrionalis. Distribution Sources: 7, 11, 12, 14, 29, 73. Two parallel lines, one on each side of the back, of raised glandular skin between the back and the sides of most North American frogs of the family Ranidae. The circular, disk-like membrane that covers the ear opening of some reptiles and amphibians. In this video, a mink frog (Rana septentrionalis) is shown by the shore of Kiwassa Lake in the rain. The mink frog is classified by some authorities, including the International Union for the Conservation of Nature (IUCN), under the scientific name Rana septentrionalis. This, however, is not widely accepted. The mink frog is a largely aquatic species of frog found in the northern United States and Canada. They rarely leave the water, unless during or after heavy rain. In this circumstance, it was raining fairly heavily, so I guess I got lucky. The mink frog gets its name from the mink, as they smell alike. The mink frog is assessed as being of least concern by the IUCN Red List of Threatened Species. This video was recorded on the Department of Environmental Conservation (DEC) owned shore of Kiwassa Lake in New York on August 31, 2013.